Late last week, Mount Kilauea on Hawaii’s Big Island erupted and sent a deluge of molten lava and toxic sulfur dioxide through the heart of Leilani Estates, a suburb of Pāhoa, destroying everything in its path. The Hawaii National Guard was activated to assist with the evacuation of 1,800 residents and the USO at Pohakuloa Training Center (PTC) shifted into 24-hour operations to connect more than 2,000 soldiers training at PTC to their friends and families at home on Oahu and elsewhere. Pohakuloa Training Center, on the Big Island of Hawaii, is located at the base of Maunakea, the only one of three volcanos on the Big Island of Hawaii considered dormant. The USO Center at Pohakuloa Training Center, Hawaii. Volunteers from the Army battalions training at the Center. At PTC, just 50 miles north of the exploding volcano, AAFES and the local restaurants closed down due to the evacuations. Military internet was affected by the ensuing earthquakes and became extremely unreliable. The USO, with its dedicated fiber connection, quickly became a hub of activity for soldiers training there. The USO was the only location with stable internet and 24-hour staffing. 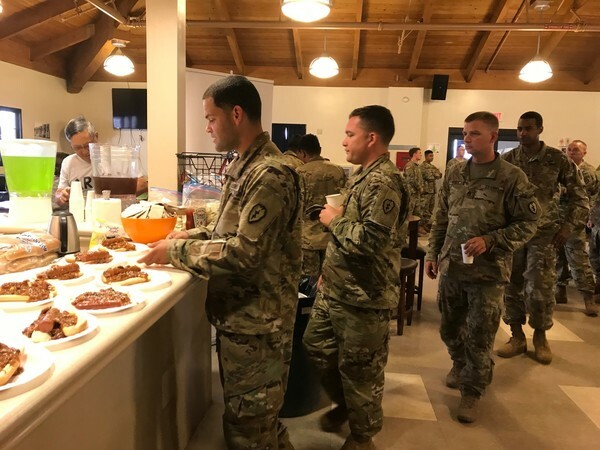 Two of the Army battalions from Schofield Barracks provided volunteers to staff the center around the clock while five USO volunteers managed operations and staffing. Connectivity, meals, snacks and drinks were provided free of charge to the soldiers and many took advantage of the opportunity to the USO to connect with their families on Oahu and with their parents on the mainland. USO Pacific Regional Vice President Charles K. Hyde wrote in an email that USO centers in the region frequently respond to no-notice, 24-hour operations requests – usually from commanders due to extenuating circumstances. PTC consists of 130,000 acres of firing ranges and a small airfield, allowing units to conduct small-arms and crew-served weapons familiarization training and qualifications, as well as artillery and mortar live fire. It is the prime training area for military forces in the Pacific region. The USO at PTC is a 4,000-square-foot center opened in 2016 to provide connectivity, relaxation, gaming and the comforts of home to troops training there. The base houses a small AFFES shoppette and Domino’s Pizza, as well as a large gym. 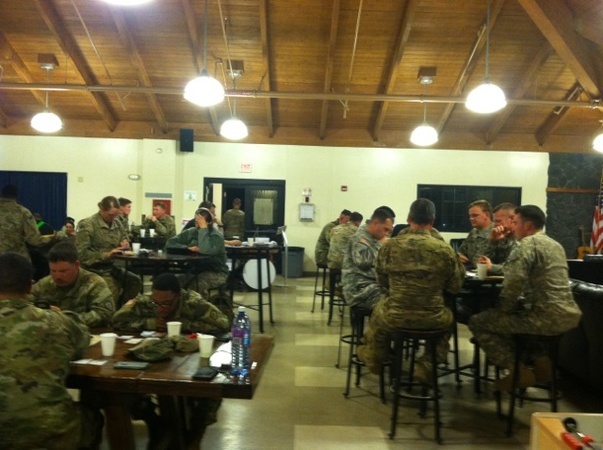 The limited services make the USO an essential partner in an austere environment. The primary offering in the center is the investment of fiber internet through a private vendor, Spectrum Internet Services. Until the USO center opened at PTC, internet and Wi-Fi connectivity was unavailable on the base. Internet connectivity is a high demand with Spectrum Internet Services reporting a 67 percent increase in internet usage on the island since the center opened, according to USO Hawaii. “Our investment in physical fiber connections to the center … has paid significant dividends,” Hyde wrote.